What is Positive Behavioral Interventions and Supports (PBIS)? Improving student academic and behavior outcomes is about ensuring all students have access to the most effective and accurately implemented instructional and behavioral practices and interventions possible. PBIS establishes the social culture and individual behavior supports needed for students to achieve both social and academic success while preventing problem behaviors. PBIS is NOT a curriculum, intervention, or practice, but IS a decision making framework that guides in the use of evidence-based academic and behavioral practices that improve important academic and behavior outcomes for all students. 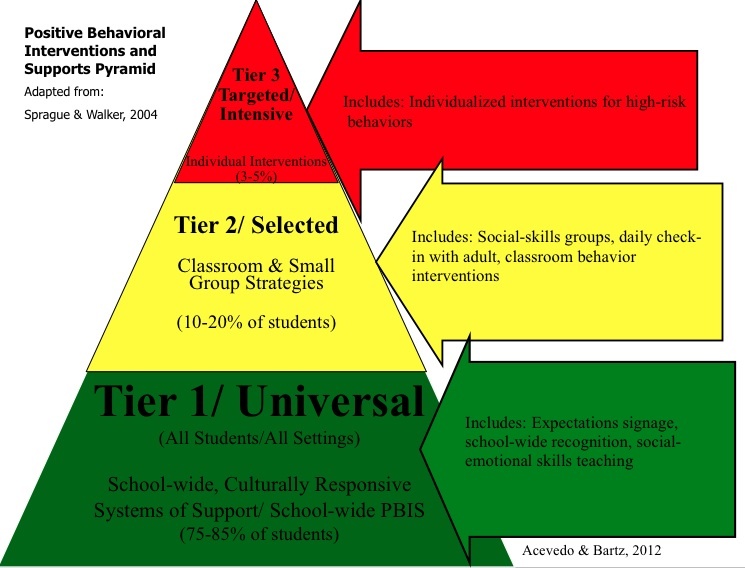 Take a look below at the pyramid showing the three levels of supports and interventions that make up a strong PBIS system. Successful PBIS schools serve 80-85% of students with the strong foundation provided by Tier 1. What Does Positive Behavioral Interventions and Supports Emphasize? In general, PBIS emphasizes four integrated elements: (a) data for decision making, (b) measurable outcomes supported and evaluated by data, (c) practices with evidence that these outcomes are achievable, and (d) systems that efficiently and effectively support implementation of these practices. How is Positive Behavioral Interventions and Supports Culturally Responsive? The framework of PBIS integrates issues of race, ethnicity, and culture in order to ensure that the activities and outcomes of PBIS equally benefit all groups of students. Through the analysis of discipline and academic achievement data, school sites identify under-served groups of students and adjust practices to better serve the needs of these students. School-wide and individual behavior support strategies are culturally relevant in that they value and acknowledge a student’s background and identity.